Illinois’ labor force shrank by 17,100 people in July, according to the Bureau of Labor Statistics. BLS also reported that the state's unemployment rate fell to 6.8% from 7.1%. However, the entire decline in the July unemployment rate came as a result of workers quitting the workforce. This grim news comes after a disastrous June, when 21,600 people dropped out of the Illinois workforce – more than any other month in state history. 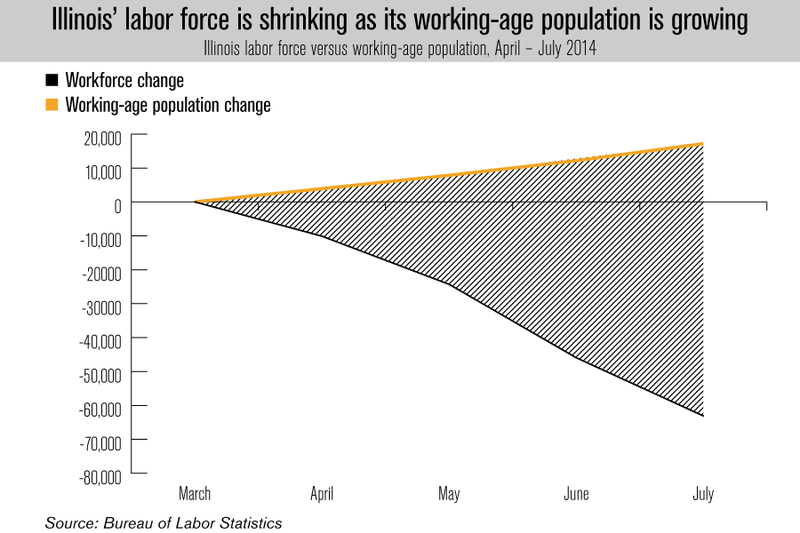 In the last four months, a total of 63,000 Illinoisans have quit the labor force. Workers quitting the workforce has been the primary factor driving the unemployment rate down to 6.8% from 8.4% in the same period. Meanwhile, Illinois’ working-age population has grown by 17,000 in the last four months, leaving a total of 80,000 working-age Illinoisans out of the workforce and unaccounted for since March. As a result, Illinois’ labor force participation rate slid to historic lows. Illinois gained 10,300 payroll jobs, according to the BLS' establishment survey. However, the state remains down 5,900 private-sector jobs on the year, the worst record of any state in 2014. Only Illinois and Alaska are down jobs on the year. Illinois remains 170,000 jobs away from recovering to the number of jobs the state had in January 2008, when recession job losses began. 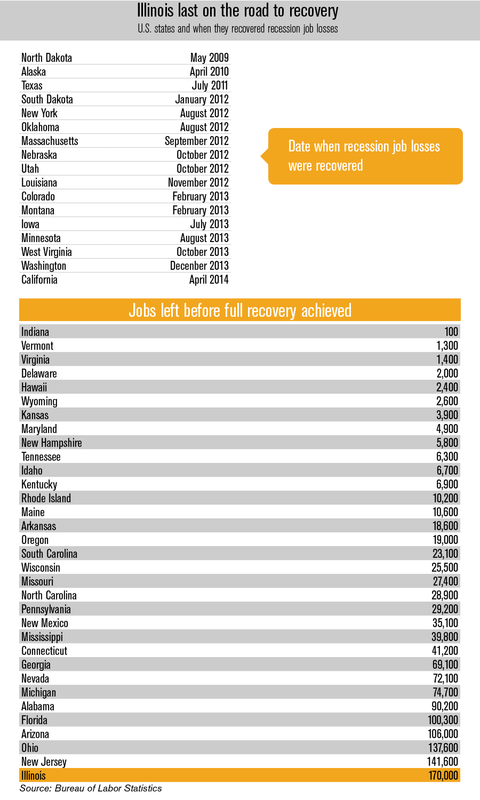 Seventeen states have already recovered all the jobs they lost during the recession. The Land of Lincoln remains furthest away from recovery of any state in the U.S.
A number of factors have contributed to the worst recovery in the U.S.
Policy leaders have done nothing to reform Illinois’ broken system of cronyism and excessive business regulation. The state’s nonsensical regulations and excessive wait times contribute to a dismal business environment, which was given an F by local small businesses. However, the most blatant policy misstep was the historic 2011 tax hike, which raised taxes on all Illinoisans by 67%, and signaled to business the state’s determination to follow a tax-and-spend direction. The 2011 tax hike put the brakes on Illinois’ jobs recovery, dramatically slowing down a recovery that, up until that point, had been keeping pace with the rest of the Midwest and U.S.
Employment growth has slowed down by more than one-half since the January 2011 tax hike. Employment growth has accelerated for the rest of the U.S. since the same date. Job growth has slowed down by more than one-quarter since the January 2011 tax hike. Job growth has accelerated for the rest of the U.S. since the same date. The first steps necessary for beginning a real recovery include admitting that there is a problem, addressing the symptoms and looking for the root causes. One obvious cause is the 2011 tax hike. To allow the state to heal, the 2011 tax hikes must be sunset and then eliminated. If not, Illinois' labor force will continue to suffer.